Tennessee Vols head football coach Butch Jones is currently on the Big Orange caravan tour, and right now that tour is in Atlanta, Georgia. Jones was asked about satellite camps, coaching changes, and more, but in the middle of all that, Jones mentioned a player on Tennessee’s roster is looking to transfer. 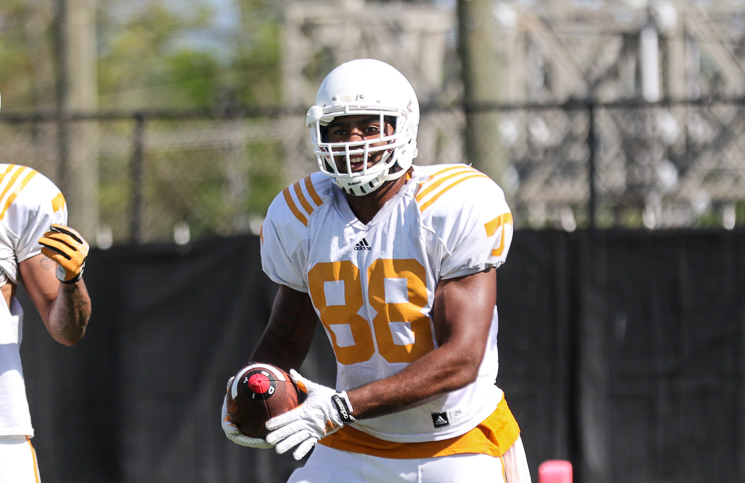 Redshirt sophomore tight end Neiko Creamer is considering transferring from Tennessee according to Butch Jones. Creamer was part of the “legacy class” in the 2014 recruiting class. Neiko’s father, Andre, played for the Vols from 1984-87 and played primarily as a defensive back and punt returner. Butch Jones says Neiko Creamer is looking to transfer. Creamer came to Tennessee as a linebacker but was moved to tight end before the 2015 season. Creamer never compiled any stats on either side of the ball and saw very minimal action while at Tennessee. No statement has been released by Creamer or his family as of yet. We will keep you updated on the situation.